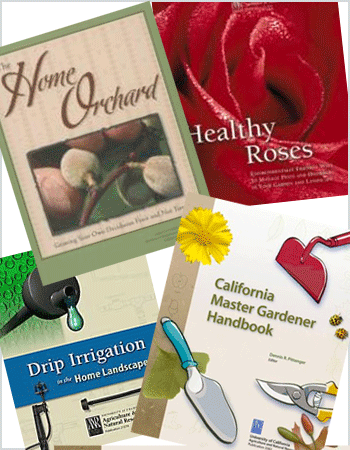 You can order any of the great reference books that your Alameda County Master Gardeners use, get a 10% discount, AND support your local Alameda County Extension Service/Alameda County Master Gardeners at the same time! STEP 2: Choose publications that you can really use and enjoy. STEP 3: Purchase the publications that you have selected, using code PRALA2 when you check out, getting a 10% discount. STEP 4: Your items will be shipped to your selected destination, where you can read them and use them as reference material. STEP 5: Feel great about yourself for contributing to programs in your community's through the Alameda County Extension Service. Thank you! For a list of ANR Free Publications to download to your computer, please click here. To visit the Main Page of the University of California Agriculture and Natural Resources Publications website, please click here.